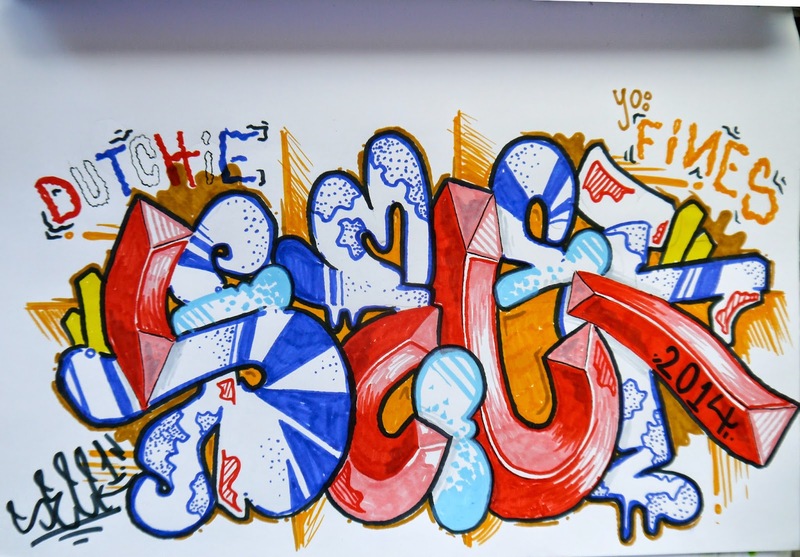 GRAFFITI SKETCH EXCHANGE - FINES x DUTCHIE! School has been a real struggle last week, but it seems there's still light at the end of the tunnel.. That's nice. There are a couple of sketches left on my desk that have to be finished, but that is something for the future. Soon I'll take the time to finish those things off. At the end of last week Fines hooked me up and gave me his blackbook. A real honor to be able to drop a graffiti sketch in between those stylish splatters. Most of the sketches are just with a ballpoint, that's how I like them.. But those who are colored are even more dope. Bigup! The world championship soccer is in full swing right now, and as I am Dutch and I live in Holland, we see the 'roodwitblauw' flag everywhere along with orange accents on shirts, in the streets, everywhere. I like the orange mood but sometimes it is such a chaos when the Dutch national team scores, that it makes me think. Like, why would you jump into the fountain with a vuvuzela just for 'your soccer team'? That's how this 'Dutchie' was made. I tried some things to create more depth in the red, like king 'SOFLES' from Australia always does. Also I blended in some blue dots, and some other effects. Point was, I had to keep some spots white; as that is one of the 3 colours in our flag. The outline is orange, with some brown that blended in nicely. Shout out to FINES! Enjoy!